and is ranked on 19th position in this year's Driver Championship. That finally gives Danny 'HuskY' Engels the opportunity to win a single event in Team Ranking as well. Especially after the perfect race in Imola, as reported on SK few days ago, where 'HuskY' managed to win both races and scored maximum points. Already mentioned, SK Racing NFS Legend Niklas 'Sliver' Timmermann had a few incidents in Imola and is suspended for the event tonight. Bj&ouml;rn 'Biertrinker' Kajewski, though, starts in Grid 3 and is aiming for another Top 5 position to get back into the second division again. With only three races to go (Monza, Okayama and Macau) the championship finally reached crunch time. MultiBC is going to stream the race LIVE at 20:30. Spectators can expect two thrilling 11 laps races for the Italian Grand Prix trophy. 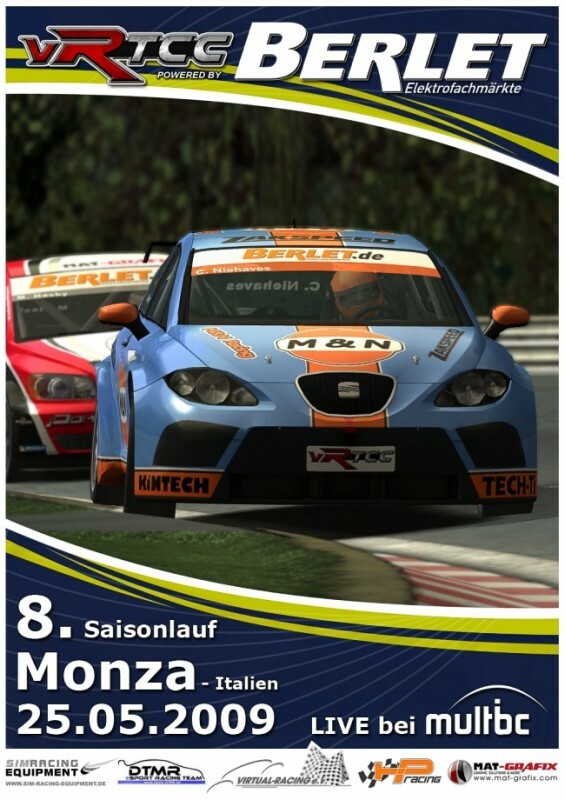 The VRTCC Grand Final will be in Macau at 22th June 2009.